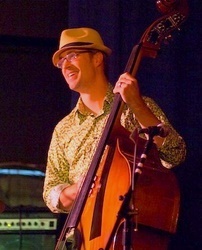 Michael Cady is Maple Street Guitar's bass specialist, and Oak Grove Music Lessons bass and guitar specialist. He has been teaching bass and guitar for over 30 years, and performing for over 35 years. He has been adding his expertise at camp not only on bass and guitar, but on quick arrangements and transpositions to help the students, ever since camp opened in 2005. The students love his many techno gadgets and most of all, his expertise on the yo-yo. Mike has studied under many teachers including Jim Woody, Lyn Deramus, David Fisher, Frank Carter, Rich Nanista, Michael Moore, Ted Howe, Mary Akerman, Sid Wolf, Jackie Pickett, and Don Strand. This variety of teachers has given him unusual insight into teaching techniques. He has taken what he considers to be the most effective methods of his various teachers and developed them into his own pedagogy. Always looking to further his own musical education, Mike continues to study with other instructors in classical, flamenco and jazz. A lover of "low and loud," in addition to his main instrument - the seven string bass - he also plays upright bass and tuba. 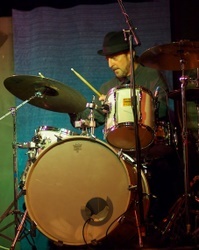 In 2018 Mike purchased and renovated a building for an all-purpose music facility. That year, ARBC began what we all hope will be a long-term relationship by holding our camp in Rehearse Live. It is the best facility we have ever had to hold our camp, and we’re delighted with Mike’s successful new business! Eskil has been performing and recording since the age of 12, in the U.S. and abroad, with Mudcat, What the...?, Orange Hat, RainHouse, Big Sky, and David Ragsdale ( Violinist with Kansas ), among many others. 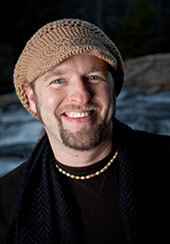 In addition to drumming, he is a vocalist/multi-instrumentalist, and composer/arranger. He has been teaching for over 20 years, and has been a camp counselor for over 10 years. He constantly pushes to further his performance, and teaching knowledge and skills, recently adding Congas, and Tablas to his percussive abilities. He is also currently writing and scoring the music for a musical production to be performed at the Uof F in July 2019. Eskil has managed Oak Grove Music Lessons since 2016, where he teaches drum set. Born in the United Kingdom, Jeep Hook began his career as a touring musician for Talk Talk, the hugely successful 80’s band whose song "It’s My Life " was recently covered by Gwen Stefani of No Doubt and for Basia, the Polish Jazz singer signed to Columbia. Jeep was later signed to Virgin Records as part of the blue-eyed soul duo, Millions Like Us. Since then he has owned and operated successful recording studios in London, Los Angeles, and now in Atlanta with hookhouse studios. Jeep has recorded and produced a wide variety of music including Hip Hop and Rap, Rock and R’n’B. He is also a talented songwriter, always willing to nurture emerging talent. We at camp know him as a dedicated teacher, committed to helping young musicians. Jeep brings his skills in songwriting and recording, as well as his creative musicianship in playing guitar, bass, keyboards and drums. Jeep masters the CDs of all camp concerts, which gives them a great professional polish. Jeep is married and has a teenage son and a daughter Sophia Joi, born on the same day in 2006 he began teaching at camp! He has coached youth sports in DeKalb County for over ten years, and is well-known by several of our campers in that role. Micki González is the owner/operator of the Atlanta Rock 'n Blues Camp. As the mom of a guitar student, she got to see first hand how the talented middle schoolers around her son struggled to find ways to learn to play as band musicians. 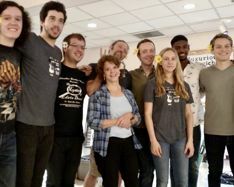 She suggested a summer camp designed to teach performance skills, working with a band, and performing challenging repertoire, all within an intense but fun week of playing and singing. And so it was that the rock and blues camp was born in 2005. Over the years the teaching model has been shaped and honed by the performer/teachers on staff, and it now can boast of fielding the most polished and challenging performances - solely by the campers - at our famous Friday night show. Micki has a B.M. and M.M. from Florida State University in Music History and Literature, and Theory. She studied voice, piano and choral conducting, and composition, along with performance practices from 1300 - present. She received a M.Div from the Yale Institute of Sacred Music , studying voice, conducting and organ, and has had a long career in both traditional and contemporary church music. She has also maintained a private voice and piano studio for many years. Richie Jones is a hardworking musician dedicated to music through the art of drumming. At a young age, Richie was beating the stuffing out of his mother's couch pillows, which landed him in trouble many times. By the age of 12, he had become inspired by rock music, rhythm and blues, funk, reggae, and all things groove. His early musical influences provided him with a foundation to play creatively, dynamically, and with strong backing vocals and harmonies. In high school, Richie played tenor/baritone sax, the quads, and bass drum, as well as steel drums which broadened his musical landscape. By the time Richie enrolled at Florida State University, he had been playing in bands touring the Southeast, and had experienced opening for Government Mule, The Derek Trucks Band, B.B. King, and Maceo Parker. From the jam/funk driven grooves of Deep Blue Sun, the americana singer/songwriters Ralph Roddenbery, Caroline Aiken, Taylor Martin, or the slide screaming' roots of the Donna Hopkins Band, Richie has been establishing himself as a versatile and proficient musician in Atlanta's music community for the past 14 years. 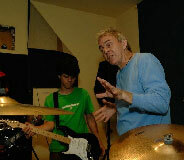 Presently, Richie is fully dedicating his time and skills to session work, gigging and teaching. Whether in a club environment or on a festival stage, Richie is always ready to sit back and let the music take him. When not in the studio or touring, he teaches both children and adults the art and passion of playing drums and percussion. "Working at Rock and Blues camp has been an incredible experience. The environment is dedicated to creating a unique life long stage/performance experience. The kids love it, we love teaching them, and the end performance proves that hard work and passion will pay off 100%!" 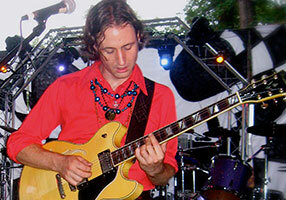 Ben Farmer is an Atlanta-based guitarist/singer/songwriter. He was born in Decatur, GA where his love of music was fostered in marching band, church choir, and the garages of various friends' houses. He finished high school as drum major of the Decatur High School Marching Band and attended Berklee College of Music in Boston, where he graduated with a degree in guitar performance and songwriting. Ben has been a part of music scenes all over the United States, from Boston to Nashville to San Francisco and Los Angeles. In 2004, he returned to Atlanta to build a music career out of his hometown. He has stayed busy since, working as both bandleader and sideman, a respected music teacher, and as a session guitarist, all the while further developing his unique voice as a writer and player. 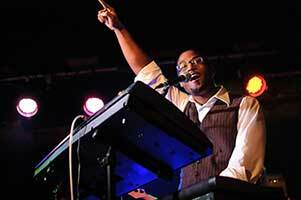 Henry White has been studying and performing music since the age of 12. Born and raised in Atlanta, he owes his early experiences in music to the Atlanta music community as well as the guidance and instruction of many great local musicians and educators. 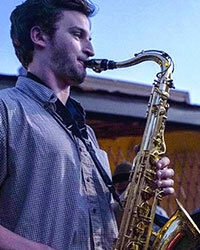 Henry, who plays several instruments, mainly tenor saxophone, is currently studying music at Florida State University as well as performing and recording in Florida and Atlanta. Henry is a longtime student of many styles of music, including jazz, funk, rock, hip hop, and pop, and he focuses the importance of being a well-rounded musician when working with students. At camp Henry helps the horn section find creative ways to work on skills such as playing as a section, maintaining a good sound, playing within a groove, improvisation, ear training, harmonic knowledge, etc. Burdett Rice has been creating music and performing since his teens. He began taking piano lessons at the age of 7 under long time St. Louis Music Director and Composer, Joseph Price. In his college years, he performed with the Opera Workshop at the University of Missouri-Columbia where he performed with the traveling company of the University of Missouri commissioned opera, "Corps of Discovery" and the premiere University Chorus. Having completed a bachelor's degree at Mizzou, studying music composition of classical and jazz, vocal performance and music theory, he went on to compose music in jazz, R&B and gospel for choirs and artists in his hometown of St. Louis, MO, including his own band, Juanita Place which met regional success, being featured in publications including DELUX magazine, Riverfront Times, and was a favorite on college radio stations. In addition to teaching, he continues his career today writing and composing songs in R&B, Hip Hop, World and Contemporary Classical music genres for various artists and companies.